More about a judicial examination of the national temperature record. The following sets out the background of the NZCSC’s application and provides some vital context. The National Institute for Water and Atmospheric Research (NIWA) is a Crown Research Institute (CRI), contracted by the Government to be its sole adviser on scientific issues relating to climate change. NIWA’s National Climate Centre is responsible for maintaining the National Climate database, mainly comprising records compiled by the NZ Met Service during the period 1853-1992. 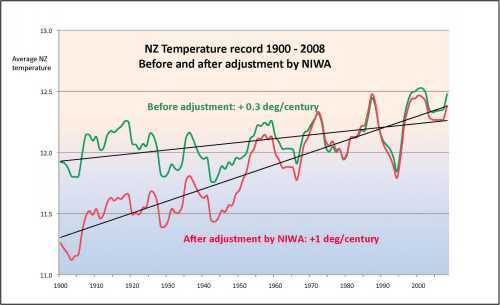 This archive finds its greatest significance in the New Zealand Temperature Record (NZTR), showing mean average surface temperatures throughout the twentieth century. Time for an independent judicial examination of the national temperature record. 1. NIWA has statutory duties to undertake climate research efficiently and effectively for the benefit of NZ, pursuing excellence and observing ethical standards, while maintaining full and accurate records. 2. 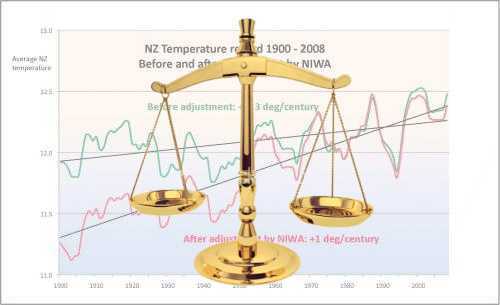 The official NZ Temperature Record (NZTR), which is the historical base for most Government policy and judicial decisions relating to climate change, wholly relies upon a “Seven-station series” (7SS), adopted in 1999. 3. The twentieth-century warming trend of 1.0°C shown in the 7SS is dependent on the use of “Adjustments” taken by NIWA from a 1981 student thesis by J Salinger, a previous NIWA employee.